The CD firmware restoration process applies to certain older Intel-based Macs equipped with built-in CD/DVD drives. Mac firmware restoration is the process of resetting your Mac's internal firmware to a known good state. This is a basic method for fixing an update that has problems, becomes corrupt, or fails to complete. Apple supplies updates from time to time, and although few people have trouble installing them, problems sometimes occur. The most common problems are encountering a power failure during the installation process or turning off your Mac during the installation. Many Intel Macs that include a built-in CD/DVD drive can restore corrupt firmware to a known good state by using a Firmware Restoration CD available from Apple. Apple supplies the firmware as a download. You supply the CD. There are six different Firmware Restoration files that cover various Mac models. Before you can use the downloadable file, you must copy it to a CD or DVD. Then, if something goes wrong during an update, you restart your Mac from the Firmware Restoration CD, and your Mac replaces the corrupt firmware with the known good version. To match your Mac with the correct file, you need to know your Mac's Model Identifier, which you can find by performing the following steps. Click the More Info button. 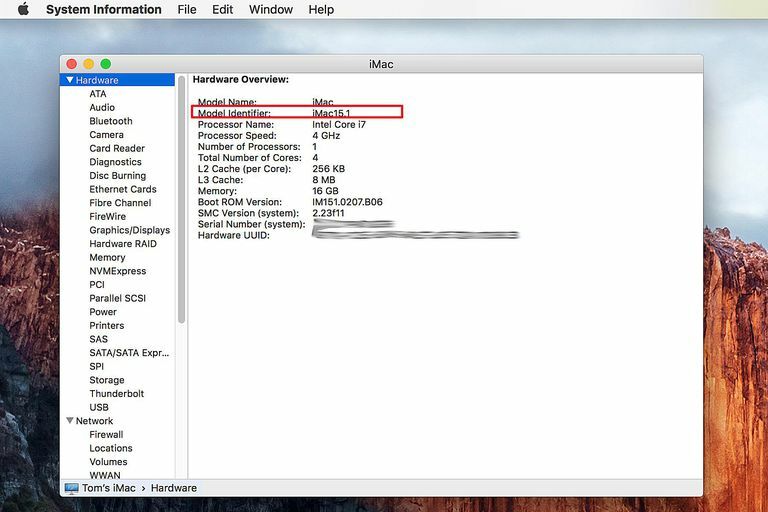 If you're using OS X Lion or later, click the System Report button to open the System Information window. If you're using an earlier version of OS X, it is already open at this point. In the left pane, select Hardware. Locate the Model Identifier near the top of the right pane under Hardware Overview. Write down the Model Identifier and use it to find the correct Firmware Restoration file for your Mac. Which Mac Firmware Restoration File to Download? If you don't see your Mac model number in this list, you may have an Intel Mac that doesn't allow firmware restoration by CD. Newer Intel Macs don't use a restoration CD. Before you can restore your Mac's firmware to its original state, you must first create a Firmware Restoration CD. The following steps take you through the process. Download the appropriate Firmware Restoration version. Launch Disk Utility located in Applications > Utilities. Click the Burn button in Disk Utility's toolbar or select Burn from the Images menu. Navigate to the Firmware Restoration file on your Mac. It is usually in the Downloads folder. Select the file and then click the Burn button. Insert a blank CD or DVD. A CD is large enough to hold the data, so it's not necessary to use a DVD. After you insert the CD, click the Burn button to create the Firmware Restoration CD. Before you begin the restoration, ensure that your Mac is powered from an AC outlet. Do not attempt to restore the firmware on a laptop while it's running under battery power. If your Mac is turned on, power it off. Press and hold the Power button on your Mac until either the sleep light blinks three times fast, then three times slow, then three time fast (for Macs with sleep lights), or you hear three rapid tones, then three slow tones, then three rapid tones (for Macs without a sleep light). Still holding the power button, insert the Firmware Restoration CD into the Mac's optical drive. If you have a tray-loading optical drive, gently push the tray closed after inserting the CD. Release the Power button. A long tone indicates that the restoration process has started. After a short delay, you'll see a progress bar. Do not interrupt the process, disconnect power, use the mouse or keyboard, or shut down or restart your Mac during the restoration process. When the update is complete, your Mac automatically restarts. When Apple removed the CD/DVD drive from Mac models, the company realized that an alternate method of recovering from a corrupt firmware installation was needed. Apple could have provided the firmware restore system on a bootable USB flash drive, but instead, it rolled the firmware recovery process into the Recovery HD hidden partition that is included with all newer Macs.